Thirteen eggs in a planter on one of Terry Allen Kramer’s terraces hatched the day she was having a luncheon for friends at her Upper East Side penthouse. 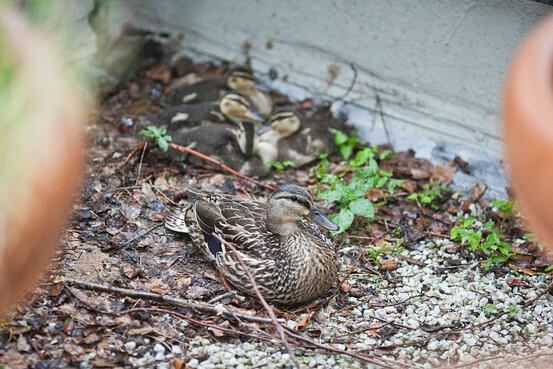 Her ducklings might have been the only baby birds nibbling on cold lobster in New York City, but they are hardly the only mallards born on Manhattan’s terraces and roof decks, according to Michelle Gewirtz, a volunteer at New York City’s Wild Bird Fund. Each year, Ms. Gewirtz rescues 10 to 15 clutches of baby ducks from rooftops, no place for them to learn to fly. When Ms. Gewirtz, a licensed animal rehabilitator who has earned the nickname The Duck Wrangler, started rescuing birds eight years ago, the majority of the nests were on the Upper East Side. Mrs. Kramer’s East 69th Street terraces first became the nesting site for a female mallard three years ago, and again this spring. This year, several nests appeared on the Columbia University campus and on roofs and in courtyards on the Upper West Side, according to Ms. Gewirtz. Central Park is rife with predators – from rats to snapping turtles — and the female mallard looks for safer spots, Ms. Gewirtz said. “So she picks these terraces that are nice and green and secluded,” she said. Mallards are precocial, meaning the ducklings are born able to eat on their own. Since there isn’t enough food for them on the rooftops, the Wild Bird Fund recommends a special high-protein food for ducklings and dark greens. Mrs. Kramer’s ducklings continued to like lobster, she said, but when her butler returned from Florida, he brought back live worms. The Wild Bird Fund was created by two women: Rita McMahon, a former market research consultant, and Karen Heidgerd, the practice manager at an Upper West Side veterinary hospital, Animal General. They met after Ms. McMahon picked up a sick Canada goose alongside Interstate 684. A year ago this month, after a decade of treating animals in Ms. McMahon’s apartment, The Wild Bird Fund opened a wildlife rehabilitation center on Columbus Avenue. Until then, New York was the only major city in the United States without one, McMahon said. The nonprofit organization aims to raise $330,000 each year from donations. As a fundraiser Thursday evening, its showing the movie “A Birder’s Guide to Everything” starring Ben Kingsley. The event begins with at 6 p.m. at the headquarters of The Colonial Dames of America at 417 E. 61st Street. In the first year, the staff treated 1,400 animals — mostly birds, from peregrine falcons to hummingbirds, and of course pigeons, along with woodchucks, chipmunks and assorted other wildlife. A turkey vulture was brought in with a broken wing after superstorm Sandy and now is at a rehabilitation center with another vulture. One recent visitor to the center was David Usdan, a psychologist who has been looking after a clutch of about 10 ducklings that hatched on his building’s roof deck in May. He got food at the center and advice from Ms. Gewirtz on creating a pond out of a plastic storage bin. And then one day, two of the ducklings somehow made it to the street below. Traffic was stopped until they and the mother got safely to a parking lot next to Mr. Usdan’s building on 113th Street near Broadway. He and his partner, Howard Brenner, shepherded the ducklings into a box, returned them to the roof and were relieved when the mother reappeared the next morning. But since then another duckling has gone missing, and recently Ms. Gewirtz was plotting how to corral the remaining four. She prefers to move the ducklings before they try to fly and risk falling to the sidewalk. They are eventually released in parks and on farms and estates. “People who take care of these ducklings get super attached to them because they are adorable,” Ms. Gewirtz said. Mr. Usdan said that he would be sorry to see his brood go, though he might get another visit next year. The mallards tend to return to the same place year after year. Tina Chen, an actor and director who also lives on the Upper East Side, has had four clutches of eggs hatch on her terrace from what she thinks is a mother-daughter duo. The first ducklings, though, were pelted to death by a fierce rainstorm. Determined to make sure the later ducklings survived, Ms. Chen fed them three times a day and kept them more than a month, in hindsight too long, she said. A few weeks after Ms. Gewirtz moved them to Central Park, Ms. Chen went to try to find them. She believes she did. But cleaning up after them was a lot of work, and at one point she erected owl and hawk decoys to try, unsuccessfully, to keep the female mallards away. 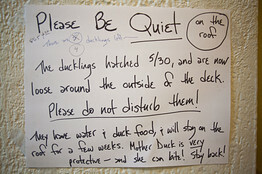 This entry was posted in Ducks, Health, Housing, News and tagged Colonial Dames of America, Columbia University, duck, New York City, Tina Chen, Tony Award, Upper East Side, Upper West Side on June 27, 2013 by naturalpfg. Canada geese like these were slaughtered in Inwood Hill Park early this morning. Bird lovers in Inwood Hill Park were horrified Wednesday morning to learn that about a dozen Canada geese and goslings were rounded up and killed in the name of aviation safety. The massacre was first reported by GooseWatch NYC, a watchbird group that was created after a much larger slaughter in Prospect Park in 2010. “I’m in tears,” said Inwood resident Suzanne Soehner, a GooseWatch volunteer. Soehner also complained that no advance notification was provided for the cover-of-darkness killing. City officials have defended the periodic killing of geese — called “culling” — as necessary to protect air traffic at LaGuardia and Kennedy airports. The city contracts out the actual killing to USDA wildlife officials. Public enemy number one? This goose (right, with duck), photographed this week in Inwood Hill Park, is now dead, thanks to a federal massacre of Canada geese in the name of aviation safety. United States Department of Agriculture spokeswoman Carol Bannerman declined to provide an exact number of victims of Wednesday’s killing, but reiterated that Inwood Hill Park is within the seven-mile bird-free zone that officials believe is necessary to protect planes. That said, there were 1,400 confirmed goose strikes between 1990 and 2012, or roughly 116 a year. But there are an estimated 87,000 flights per day, meaning bird strikes occur in one out of every 270,000 flights. Lightning strikes airliners more often. Still, goose strikes have been charged with bringing down aircraft. The Prospect Park goose slaughter, for example came after the famed “Miracle on the Hudson” safe landing of a US Airways plane by Chesley “Sully” Sullenberger in January, 2009 — a landing allegedly necessitated by a bird strike. Geneviève Mathis, local member of Goose Watch NYC, said she cried when she saw the killing field. The bird-free zone was expanded to seven miles around each airport after that near fatal crash. Opponents say that culling does not solve the problem because other geese return to fill the bird-less vacuum. “When you cull geese, they get replaced,” said Ken Paskar, president of Friends of LaGuardia Airport and a former lead safety representative for the FAA. The slaughter in Inwood Hill Park marks the start of the USDA killing season. Typically, agents capture and kill geese during the summer molt when they can’t fly. In 2012, Bannerman said, the 290 geese collected at city properties yielded 258 pounds of meat to charities upstate, near the goose processing plants. This entry was posted in Geese, News and tagged Bannerman, Canada, Canada Goose, Inwood Hill Park, New York City, Prospect Park, United States Department of Agriculture, USDA on June 20, 2013 by naturalpfg. KFC’s traditional menu, chicken legs, wings, thighs and breasts with bones are on their way out. But why? Perhaps Colonel Sanders and the KFC concept needs revamping since it lacks fast food competitor Popeye’s’ urban, Louisiana flavor and appeal. Kentucky Fried Chicken’s cursory announcement that bones may be eliminated from its time honored menu should have Colonel Sanders rolling over in his secret recipe mix. Still, the menu switch up may be great news for KFC competitors like Church’s and Popeye’s. All three chains have built their companies on its crispy chicken recipes and meals. Traditionally, meal boxes are boned pieces of white and dark meat. KFC says its decision to go boneless is a response to a generation of consumers who grew up on chicken nuggets, but McDonald’s introduced the chicken McNugget almost 30 years ago. Since then, a number of chains have picked up on the American trend for buffalo wings, most international Pizza chains serve boned wings. Zaxby’s and Buffalo Wild Wings are favorite stops with younger generations. Chik-a-Filet serves boneless sandwiches and most fast food burger chains sell boneless pieces and sandwiches too. KFC only introduced boneless strips and bites to its menu a year ago. KFC boneless premieres April 14 only in the U.S ; both white and dark meat portions are available. But the boneless menu may have more to do with portion, than bones. Today’s younger generation and younger families are eating healthier. They’re eating smaller portions of healthy foods more, rather than large servings of foods with fats, cholesterol and other precursors to heart disease and diabetes. To further the argument, New York City went as far crafting a ban on soda sales of bottles larger than 16 oz in its restaurants. After an internet photo of a large pink slimey goo said to be the “meat” for McDonald’s Chicken McNuggets, McDonald’s dropped the pink slime ingredient used to makes it boneless chicken and hamburger meat. In 2011, a consumer launched a lawsuit against Taco Bell. The lawsuit claimed that fillers in its meat products decreased nutritional value. For a number of reasons, whether or not KFC boneless menu is really targeted to the younger generation is a legitimate question pondered briefly on MSNMoney. But fast food presidents aren’t typically as people concerned as they are profit driven. Earlier this month, Popeye’s US president lashed out against mandated health insurance legislation and offered that many of his full-time employees may reduce hours in order to avoid paying health insurance. It doesn’t appear likely the fast food conglomerate will consider raising employee salaries. This entry was posted in Chickens, Health, News and tagged Buffalo Wild Wings, Chicken McNuggets, Colonel Sanders, KFC, McDonald, New York City, Taco Bell, United States on April 9, 2013 by naturalpfg.